Prime Minister Benjamin Netanyahu is set to fly to Nairobi next week to attend the inauguration of President Uhuru Kenyatta, his office said Thursday.Netanyahu will fly in Tuesday morning and leave later the same day after attending the ceremony to swear in Kenyatta, who has led the East African country since 2013 and won a controversial election last month, which some observers say was rigged. The country’s opposition boycotted the rerun election, leading the incumbent to garner 98.25% of votes cast. Voter participation was at 38 percent. The election’s first round, on August 8, was overturned by the Supreme Court after opposition leaders complained the results had been hacked. Given doubts over the election’s legitimacy, the international community has so far largely held back its congratulations to Kenyatta. And yet, some 100,000 people are expected at Tuesday’s inauguration, to take place in Nairobi’s Kasarani Stadium, according to local reports. Opposition groups that refuse to accept Kenyatta’s election victory are planning to hold an “alternative inauguration,” which might erupt into violence, observers of African politics said. 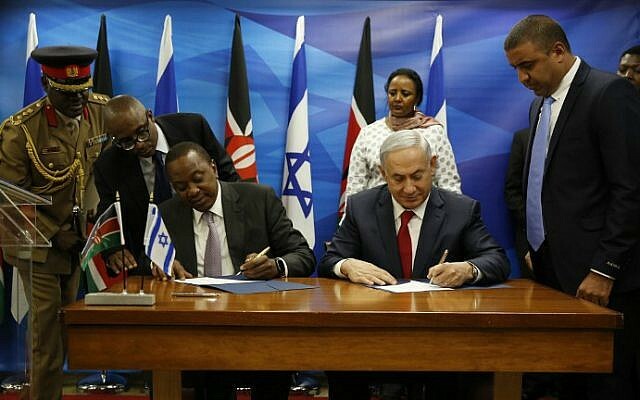 Israel sees Kenya as a key strategic partner in East Africa. The two countries cooperate in many areas, including in the fight against Islamic terrorism. In July 2016, Netanyahu became the first sitting Israeli prime minister to visit Kenya. During the visit, Kenyatta pledged to help Israel gain observer status at the African Union. “We believe that there is need for us as a continent to once again to re-engage Israel on a more positive basis, with an understanding that our partnership can help make this world that much more secure,” Kenyatta said at a joint press conference with Netanyahu at Nairobi State House. Israel and Kenya are “natural partners,” Netanyahu said. “We face common challenges, the first among them is as I’ve just said, terror… Now, alongside these common challenges, Israel and Kenya share common opportunities in technology, water, agriculture, cyber and much more.” In February 2016, Kenyatta — the son of Kenya’s founding president Jomo Kenyatta — visited Jerusalem. “My hope is that my visit to Israel will open another chapter in our long history of relations for the benefit of our two countries and peoples,” he said at the time.